Abstract: Inability to manage fungal growth (Aspergillus, Fusarium and Rhizopus spp.) in germinating corn seed used as larval medium in a laboratory colony of spotted cucumber beetles (Diabrotica undecimpunctata howardi Barber [Coleoptera: Chrysomelidae]) stimulated experimentation to evaluate the efficacy of laboratory fungicide seed treatment and its components with and without agitation, and to determine whether the incidence of fungus in germinating seed differed between seed lots or varieties. The possibility of fungi residing in cracks in corn seed, within the corn seed beyond the reach of fungicidal solutions, and in pits in the exochorion of beetle eggs is discussed. Fungicides reduced fungal infestations below levels of the untreated seed, but percentage of infection of fungicide-treated seed differed between seed lots or variety, suggesting internal as well as surface infection of seeds. Pasteurization of seed and irradiation of seed to eliminate internal fungi is discussed. Spotted cucumber beetle (Diabrotica undecimpunctata howardi Barber) and the closely related banded cucumber beetle (SCB, Diabrotica balteata LeConte) have been reared successfully in the past (Pitre 1962, Chalfant and Mitchell 1968, Cuthbert et al. 1968) with sprouting corn used as the medium for larval development. However, recent attempts to rear spotted cucumber beetle on sprouting corn seed were hampered by fungal infections, primarily of Aspergillus spp. The conditions required for larval development—temperatures between 21 and 30 °C and relative humidity of 40–80% or 100% relative humidity to enable egg hatch (Chalfant and Mitchell 1968)—provide excellent conditions for fungal growth during the insects’ hatching, larval, and pupation stages. Possible sources of fungal infection in the rearing system included not only corn seed surface contamination, but also internal seed contamination (Baird et al. 1996, Payne 1998) and the spotted cucumber beetle eggs used in the rearing project. 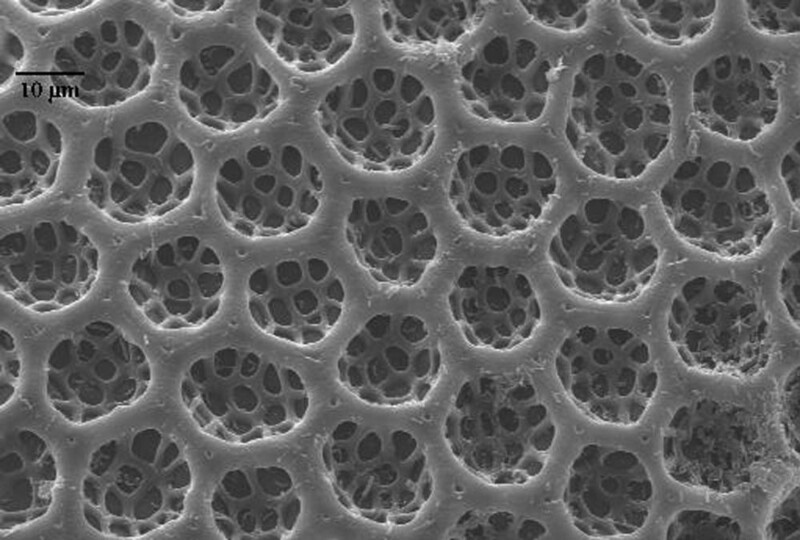 Although the eggs were sterilized by using a sodium hypochlorite solution, the chorion of SCB eggs is covered with hexagonal pits (Figure 1) that trap air in flooded conditions (Jolivet and Verma, 2002) and could have prevented the fungicidal solution from entering all the crevices able to harbor fungal spores. Since air in the rearing facility was filtered continually to remove particles of 5 µm and larger, and because the containers and other materials used in rearing were either autoclaved or treated with fungicide prior to use, it is likely that fungal spores were introduced with the corn seed or insect eggs. Although it is unlikely that the eggs were the primary source of contamination, fungicides used in preparation of the materials for rearing were evaluated by using corn seed from the same seed lot as used in the rearing procedures without introduction of insect eggs. Other locally obtainable, untreated corn seed varieties were also evaluated to determine if fungal infestations differed between seed lot or variety. Figure 1. Chorion of spotted cucumber beetle egg showing hexagonal pits. These pits act as air sacs (Jolivet and Verma, 2002) that could harbor fungal spores and protect them from fungicide treatment. Fungicides were evaluated within a temperature- and humidity-controlled chamber at the Mississippi State University Insect Rearing Center, Department of Entomology and Plant Pathology, based on the rearing procedures of Cuthbert et al. (1968). Environmental conditions were: 16: 8 light: dark, 27 ± 1 °C, and 55 ± 5% relative humidity. 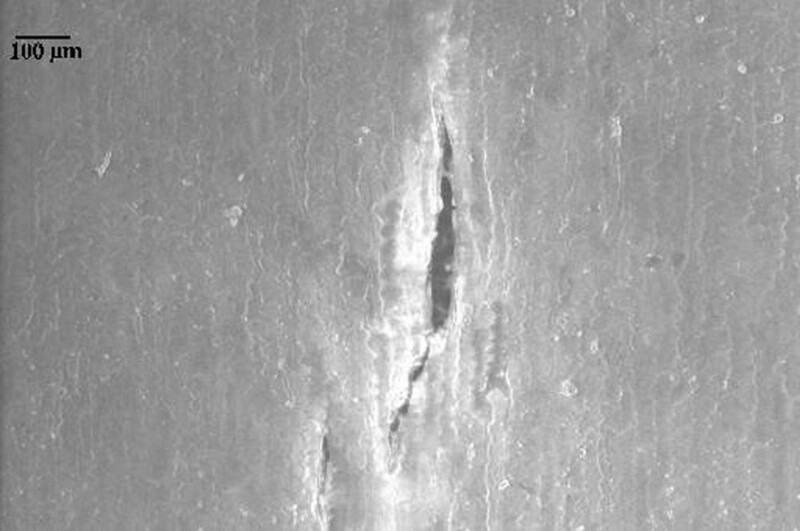 Air within the chamber was constantly filtered to remove particles of 5 µm and larger. Samples in which fungal growth was observed on any sample date were assumed to have fungal growth on subsequent sample dates. Statistical analyses were conducted to separate treatment means by using the Statistica data analysis software system (StatSoft, Inc. 2009) and the general linear model. Homogeneity of variance was determined by using the Cochran C test. Trial 1. Four different fungicide treatments plus an untreated check were evaluated at three moisture levels (Table 1) by placing seed on filter paper-covered sand in 9-cm Petri dishes. Petri dishes were sanitized in a 0.06% sodium hypochlorite solution for 10 minutes and then rinsed in running tap water for one minute. The dishes were then filled to 4 mm depth with autoclaved sand covered by a single layer of filter paper that was previously autoclaved at 121 °C and 15 psi. Sodium hypochlorite and Captan treatments were rinsed from corn seeds with tap water for one minute. Untreated seeds for the untreated check were soaked in tap water for 10 minutes followed by a tap water rinse for one minute. Four corn seeds were placed well apart on the filter paper in each Petri dish, and all dishes received 5 ml of distilled water through a 1-cm hole in the top of each Petri dish. There were 4 replicates of 4 seeds per treatment. The filter paper and sand were re-moistened by adding 3 ml of distilled water according to moisture level; high (H) every 24 hours, medium (M) every 48 hours, and low (L) every 72 hours. The percentage of seed with fungal growth was collected 3 and 4 DAT (days after treatment). Trial 2. A second trial with nine treatments (Table 2) was conducted to see if agitation of the corn seed with a VWR Scientific Products orbital shaker at 100 cycles per minute would improve fungicide efficacy. The other parameters of the trial were the same as for Trial 1. Agitation was conducted under the assumption that fungal spores concealed in micro-cracks on the seed surface would more likely be contacted by the fungicidal solution than when soaked without agitation. Trial 3. A third trial eliminated the possibility of cross-infection between the seedlings. Since moisture levels in previous trials did not affect percentage of seeds with fungus, only one moisture level was used, and smaller Petri dishes with solid lids allowed use of only moistened autoclaved filter paper in lieu of sand. Seeds from four varieties plus an additional seed lot from one variety were sanitized as in Trial 1, placed individually via autoclaved forceps into 50 × 11 mm plastic Petri dishes containing two layers of filter paper moistened with 0.6 ml of distilled water, and maintained in the same chamber with the same conditions as in trials 1 and 2. There were 10 seeds per replicate and five replicates in a randomized complete block design. Seeds were evaluated visually after 72 and 96 h (3 and 4 DAT) for presence of fungal growth. Trial 1. There was no significant interaction between moisture level and percentage of seeds with fungus among fungicide treatments in Trial 1, when the percentage of seed with fungal growth was analyzed as arcsin(sqrt[x]) transformed data across 6 sample dates (DF 8,24; F = 0.760, p = 0.640). 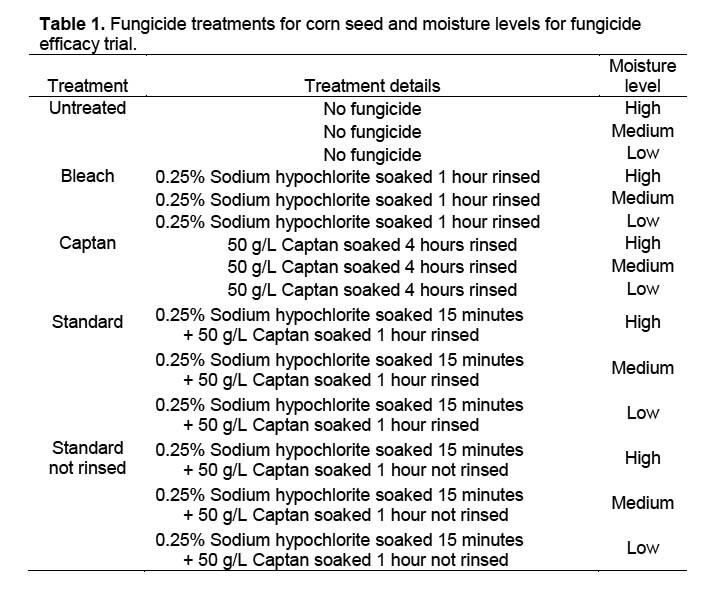 Data were therefore combined across moisture levels for further analyses of data collected 3 and 4 DAT, resulting in significant differences between the untreated control and other treatments, but no differences between fungicide treatments (Table 3) (3 DAT: DF = 4,52; F = 9.334, p < 0.0001; 4 DAT: DF = 4,52; F = 0.93, p < 0.0001). The obvious difference in fungal growth between the surface-sterilized and untreated seeds indicated a rapid development of fungal spores on the exterior of the untreated corn seeds. The fact that there were no differences in percentage of seed with fungal growth between fungicide treatments suggests that external contamination was controlled and that internal seed contamination was unaffected by the treatment. Trial 2. Agitation was used in this study to determine if agitating the seed-containing containers during fungicidal treatment affected fungicidal efficacy. Moisture level had no effect on the result of this trial (DF = 4,12; F = 1.897; p = 0.176) and data were combined across moisture levels for analysis. Differences among treatments were significant at 3 DAT (DF = 2,6; F = 142.3; p < 0.0001) and 4 DAT (DF = 2,6; F = 157.0; p < 0.0001) (Table 4). The untreated check had more fungal growth than the standard or the standard plus agitation treatments, but there were no differences between the agitated and standard treatments. Scanning electron microscope images of corn seed used in this trial indicated that fungal hyphae were present on the untreated corn seed (Figure 2) after two days in a moisture chamber, and cracks were present on the corn seed coat (Figure 3). Figure 3. Corn seed coat showing crack large enough to possibly harbor fungal spores. Magnification of 201×. Trial 3. There were significant differences in the percentage of seeds with fungal growth between varieties for fungicide-treated (DF = 4,16; F = 9.981; p = 0.0004) and untreated seed (DF = 4,16; F = 5.336; p = 0.0063) (Table 5). Popcorn resulted in less fungal-infected seed than other varieties regardless of fungicide treatment. Among seed varieties treated with fungicide, Yellow Jarvis resulted in fewer infected seed than did Trucker’s Favorite (Lot 148). Other varieties did not differ from Yellow Jarvis. Trucker’s Favorite (Lot 148) seed not treated with fungicide resulted in fungal growth on 88% of the seed. This compared favorably with results of Trial 2 (93.8%), indicating that counts within Petri dishes with more than one seed (Figure 5) (Trials 1 and 2) were valid. The results obviously indicate the need to carefully select seed and seed varieties for use in insect rearing. 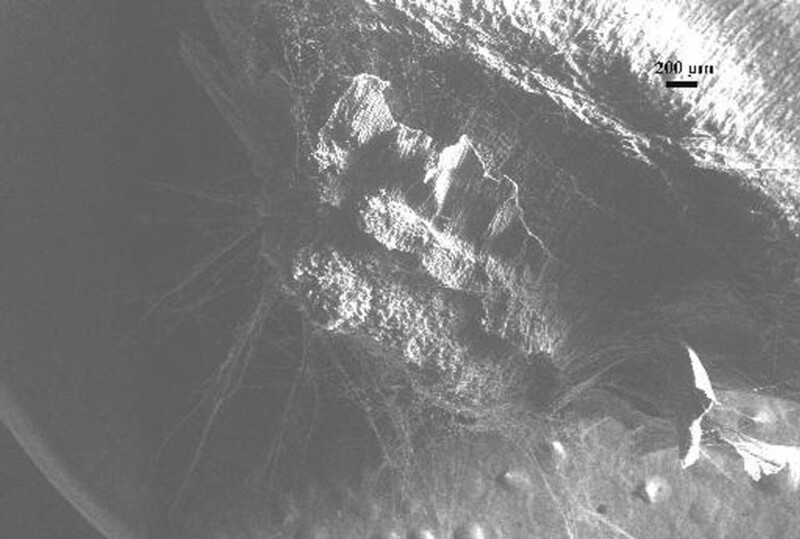 Scanning electron microscope images revealed cracks and fissures (Figure 3). Fungal hyphae on seeds were readily observed, indicating that corn seeds were the likely carrier for fungi in the insect rearing procedures. Since agitation in fungicidal solutions did not reduce the incidence of fungal-infected seeds compared with the standard treatment without agitation, it can be assumed that if these cracks harbor spores, then agitation during fungicidal treatment is not sufficient to sterilize them. Because internal contamination of seed is indicated by the failure of external sterilization, other sanitation and fungal control tactics such as treatment of seed with gamma radiation (Cuero et al. 1986) might be necessary to completely control fungi. 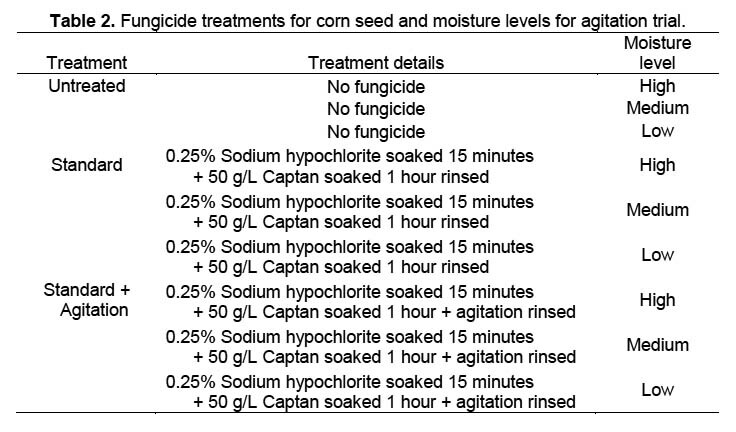 The soaking of seed in water for five hours followed by soaking in hot water (55 °C) for 10 minutes has been effective in eliminating Fusarium moniliforme from corn seed (Daniels 1983), however this procedure did not eliminate fungal growth on seed in our experiments. Thanks to Sandra Woolfolk for identifying the fungi in the colony, Amanda Lawrence for conducting the tests for larval disease, Dr. Frank Davis for input and insight in insect rearing, and William Monroe for SEM imaging. Approved for publication as Journal Article No. J-11786 of the Mississippi Agricultural and Forestry Experiment Station, Mississippi State University. Baird, R. E., D. M. Huber, and B. G. Mullinix. 1996. The mycobiota from seeds of shrunken-2 (sh2) sweet corn. Mycopathologia 132: 147-154. Chalfant, R. B. and E. R. Mitchell. 1968. Continuous rearing and notes on biology in culture of the southern corn rootworm Diabrotica undecimpunctata howardi Barber (Coleoptera: Chrysomelidae). Journal of the Georgia Entomological Society 3(2): 47-50. Cuero, R. G., J. E. Smith and J. Lacey. 1986. The influence of gamma irradiation and sodium hypochlorite sterilization on maize seed microflora and germination. Food Microbiology 3: 107-113. Cuthbert, F. P. J., C. S. Creighton and R. B. I. Cuthbert. 1968. Mass rearing banded cucumber beetles, with notes on rearing spotted and striped cucumber beetles. Journal of Economic Entomology 61(1): 288-292. Daniels, B. A. 1983. Elimination of Fusarium moniliforme from Corn Seed. Plant Disease 67: 609-611. Jolivet, P. and K. K. Verma. 2002. Biology of leaf beetles. Intercept Limited. Andover, Hampshire, UK. Pg. 82. Payne, G. A. 1998. Process of contamination by aflatoxin-producing fungi and their impact on crops. In Ed. K.K. Sinha and D, Bhatnager. Mycotoxins in agriculture and food safety. Marcel Dekker Inc., New York. Pgs 279-306. Pitre, H. 1962. Biology of the banded cucumber beetle, Diabrotica balteata Leconte, in Louisiana. Journal of Economic Entomology 55: 904-906. StatSoft, Inc. 2009. STATISTICA (data analysis software system), version 9.0. www.statsoft.com.